WILMINGTON, N.C. – At its annual meeting, Cape Fear Museum Associates, Inc. honored retiring board members, elected new officers and two new Board members. Mike Ryan retired from the Board and was recognized for his six years of service. Lori Feezor was elected as the new president of the Board, replacing Mike Hudson. Samantha Dooies is the new vice-president. Sean Frelke remains treasurer and Lynore Young remains as secretary. 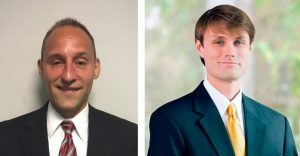 Dan Goodwin and Allen Trask, III were elected to each serve a three-year term on the Associates Board. Goodwin is vice president of the New Hanover Regional Medical Center Physician Group. He earned his bachelor’s degree in health science and policy from the University of Maryland and a master’s of health administration from Virginia Commonwealth University. Trask, a Wilmington native, is a litigation attorney with Ward and Smith Attorneys at Law. He earned his bachelor’s degree in political science from East Carolina University then his juris doctor Campbell University.